As the leading hearing specialists in the Las Vegas area, we see a large number of patients suffering from tinnitus symptoms. The constant background noises associated with tinnitus can be incredibly wearing for the people who suffer from tinnitus and without intervention from a hearing specialist, there is little which can be done to treat tinnitus. When you decide to work with the Hearing Associates of Las Vegas, our hearing specialists can give you access to the most advanced tinnitus treatment options. One of the highly effective treatment options we have seen our patients succeed with is the Levo System. The Levo System is a tinnitus treatment system developed by Otoharmonics, which can help patients manage tinnitus symptoms. 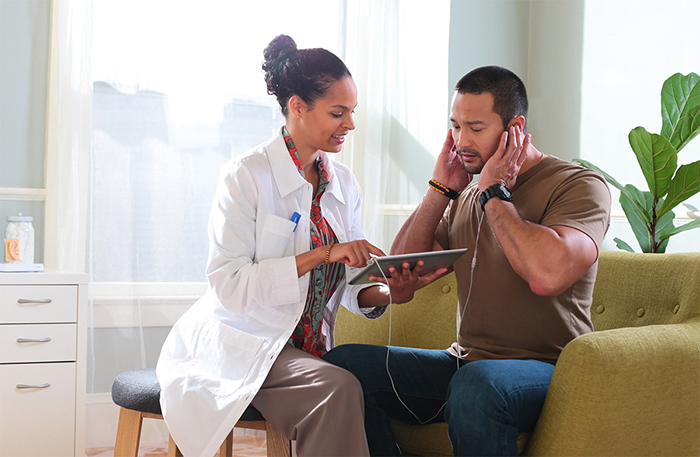 Using a custom-built and hearing specialist-guided sound therapy program, the Levo System helps relegate patient’s awareness of their tinnitus and move it to a lower level of conscious awareness. There are three parts to the Levo System – the Levo manager, the patient device, and the Levo custom earbuds. Each of these parts plays a key role in the successful treatment of a patient’s tinnitus. Using the Levo manager, the Levo System is set to create a sound which matches the patient’s own tinnitus symptoms. As a person’s tinnitus struggles are highly individual, the Levo manager has many adjustments and matching options to allow for a high level of sound customization. Once the sound therapy program is set, it is saved for our hearing specialists to reference on the patient’s return visits. The sound match program is sent to the patient’s personal Apple device so it can be used by the patient at home. Also, custom earbuds are made, so they can be specifically molded to the patient’s ear to increase the effectiveness of the system. At the patient’s home, the patient will use the Levo system every night as they sleep. As the Levo system plays the patient’s custom tinnitus sound, their brain will become trained to ignore the tinnitus sounds. The patient will be able to make certain sound adjustments to their Levo program. With regular check-ups with our hearing specialists, a patient’s tinnitus sensitivity will be tracked in the Levo manager and adjustments made to the Levo system as needed. The push to study and treat tinnitus is a fairly recent innovation. As researchers have become more aware of the far-reaching effects of tinnitus on a sufferer’s mental and emotional health, there has been a more concentrated effort to study different tinnitus treatment methods. Three studies in particular have examined the effect of tinnitus sleep therapy and can attest to the usefulness of the Levo system in treating tinnitus. In “Tinnitus treatment with sound stimulation during sleep”, researchers tested sound therapy during sleep on 11 patients who struggled with tinnitus. This experiment was performed over the course of six months. Within the first week, the majority of the patients in the study reported a decrease in tinnitus symptoms. By the time the first month had passed, all the patients reported lessened symptoms. At the end of the study, three of the patients reported times of complete silence while the other eight had significantly decreased their tinnitus symptoms. The paper “The Impact of Sound on Electroencephalographic Waves during Sleep in Patients Suffering from Tinnitus” presented further information on how tinnitus symptoms can be affected by sound therapy while the patient is asleep. Ten patients made up the study group, and the researchers were able to observe that there was a direct effect on the patients’ sleeping sensory processing, no matter the stage of sleep the patient was experiencing. A key factor notation made by the researchers was the effect of customizing the tinnitus treatment sound to the patient and noted an increase in the sleeping mind’s processing ability. Lastly, a study entitled “Impact of reduction of tinnitus intensity on patients’ quality of life” reported on the results of working with tinnitus patients over the course of three months. Researchers used a customizable sound program, the results of each customization which was then downloaded to the patients’ device. An average 62% reduction of tinnitus symptoms was reported by the participants of this study. A large part of the success of the Levo System depends on your regular use of the sound therapy program at home. You will need to use the Levo System every night so you can effectively train your brain to ignore your tinnitus. Depending on the intensity of your tinnitus that day, set your device’s Levo program to match. You can also track how effective the program is for you, which will help our specialist adjust your program. Also, be sure to use the custom Levo earbuds, as they will be developed to fit you comfortably and with accurate sound delivery. If you are interested in using the Levo System to reduce your tinnitus, you will want to work with the Hearing Associates of Las Vegas. We will start you in our Tinnitus Relief Studio, then our tinnitus experts will discuss treatment options as well as administer a hearing evaluation and the Levo System frequency test. After a discussion about the various tinnitus treatment options, and if you decide that Levo sound therapy is right for you, we will make molds for custom fitted earbuds. On your next visit, we will make a sound match to your unique tinnitus sound frequency. Over the next three months, you will wear the Levo System while sleeping. Over time, we will track how your brain will habituate or gradually grow accustomed to the tinnitus noise allowing you to function in a normal, day-to-day way. By monitoring your progress, we are better able to ensure the success of your tinnitus treatment. So, whether you are interested in trying the Levo System or other tinnitus treatment options, contact us for a consultation. We will be able to help you determine which treatment options are best suited to your tinnitus and you can start hearing more of the sounds you want to hear!